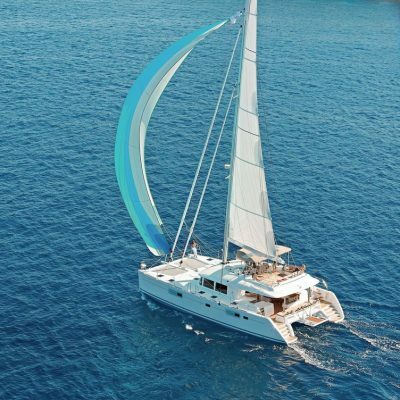 A blue-water cruising catamaran par excellence. 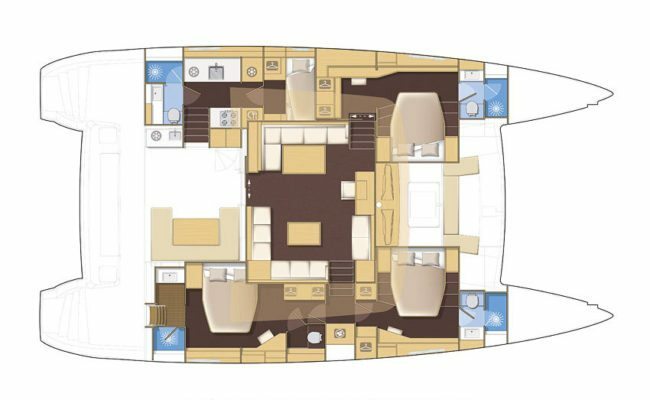 The Lagoon 560 is a blue water cruising catamaran par excellence and offers all the features of a truly luxurious home from home. 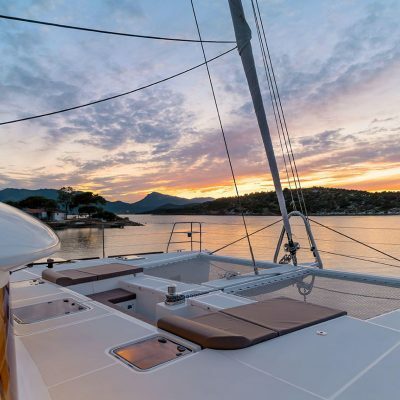 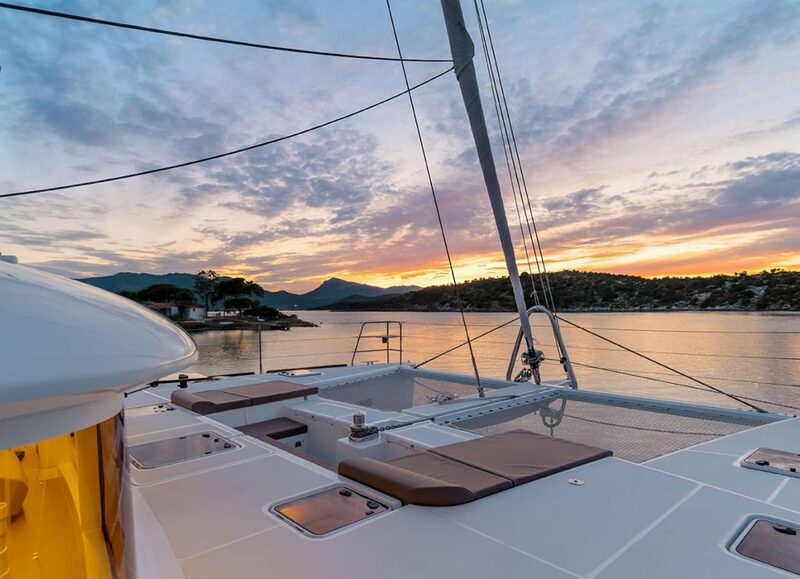 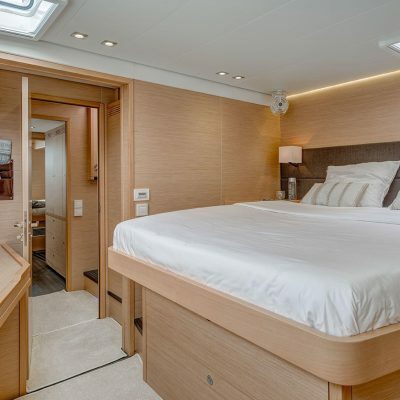 She has a high freeboard, imposing fly-bridge, three outside social areas, a palatial interior, and a selection of design packages to suite the most discerning sailor. 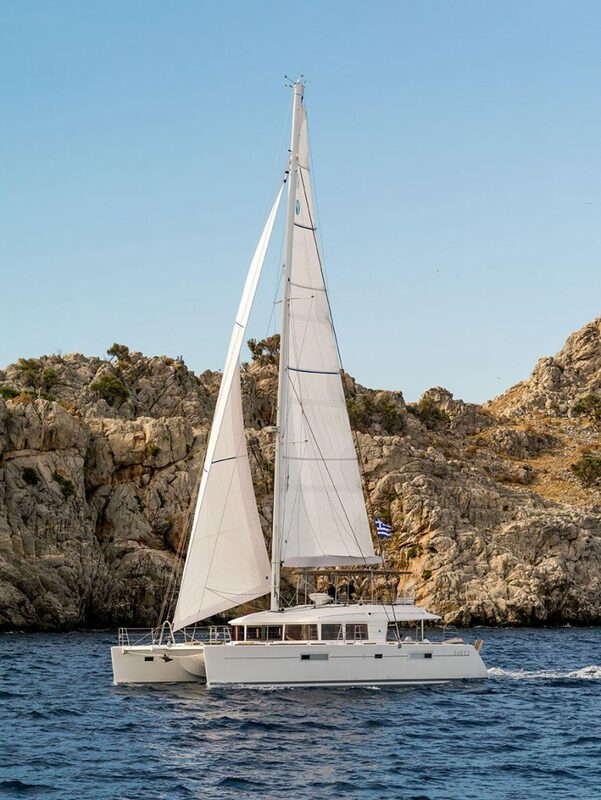 Built to your own personal taste she can be completely customized, making her as individual as you are. 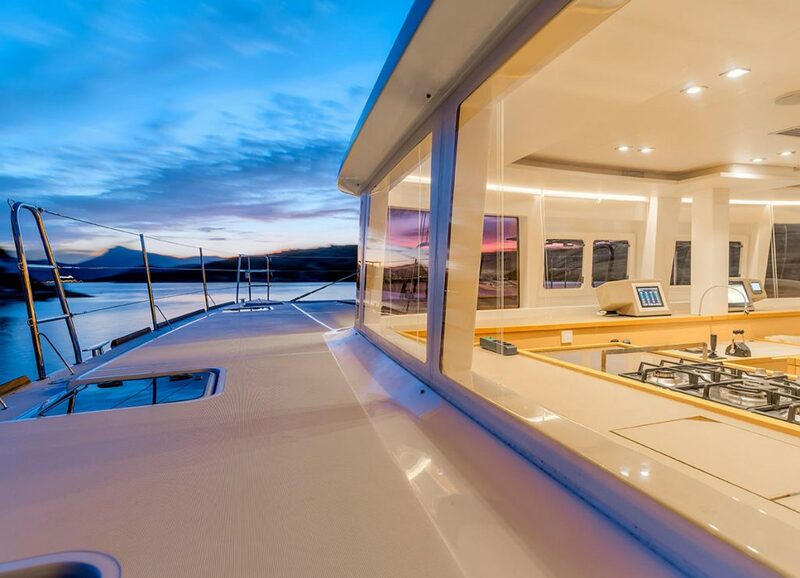 Lavishly appointed with air-conditioning throughout, electric heads, water-maker, washer dryer, dishwasher, wine cellar, tender-lift, under water lighting, additional fridges, full suite navigation and entertainment systems and much more, you will want for nothing. Optimised hulls have saved weight and she is strong and stiff, and has an impressive sailing performance. 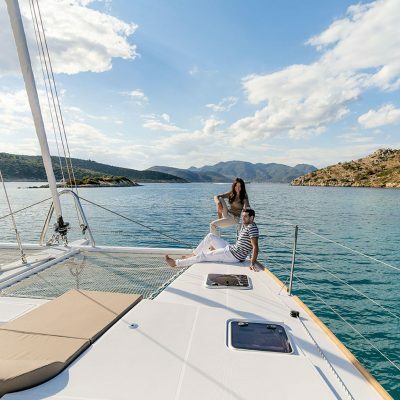 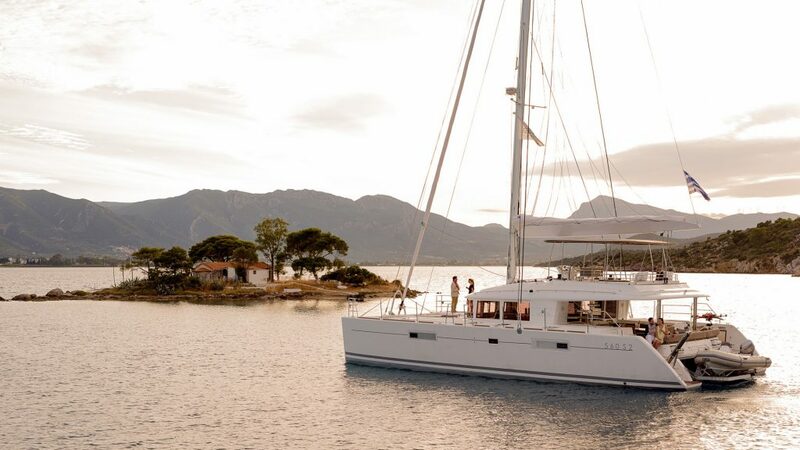 Perfect for Caribbean sailing adventures. 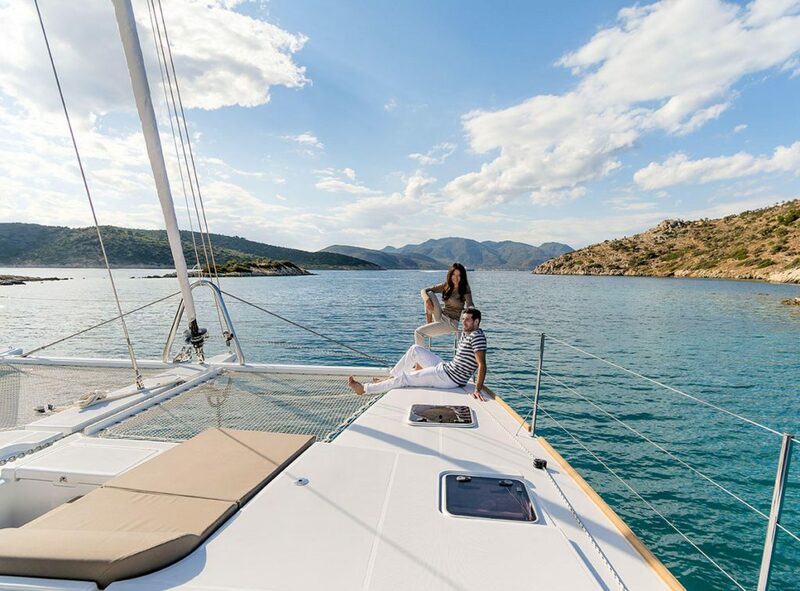 If you would like to find out more or buy a Lagoon 560 contact us here, or email Robin Hodges, our yacht sales manager. 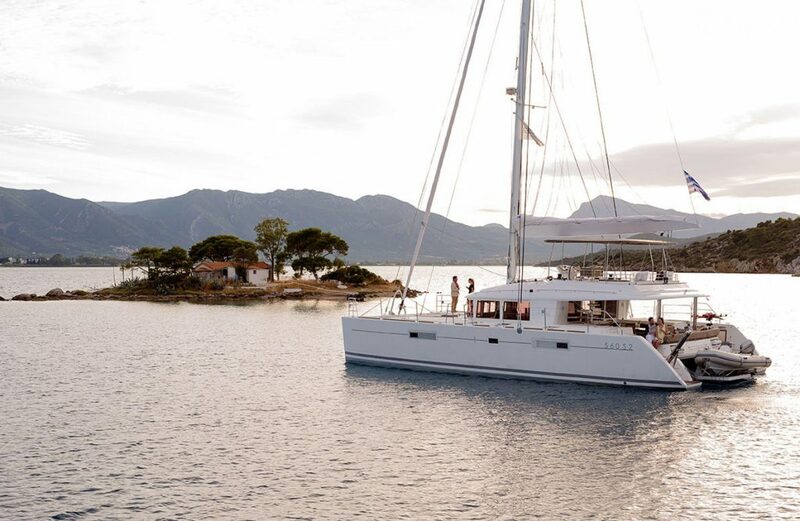 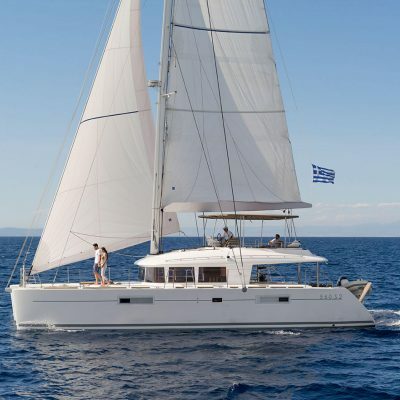 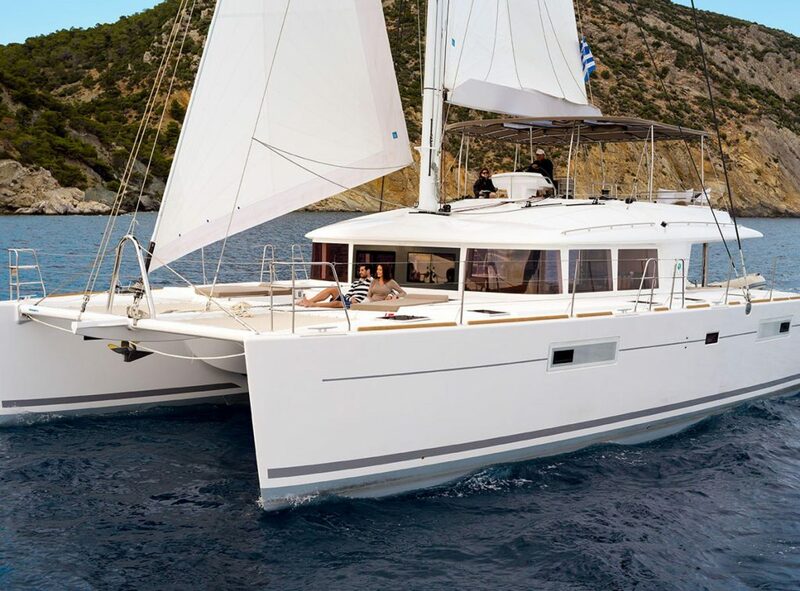 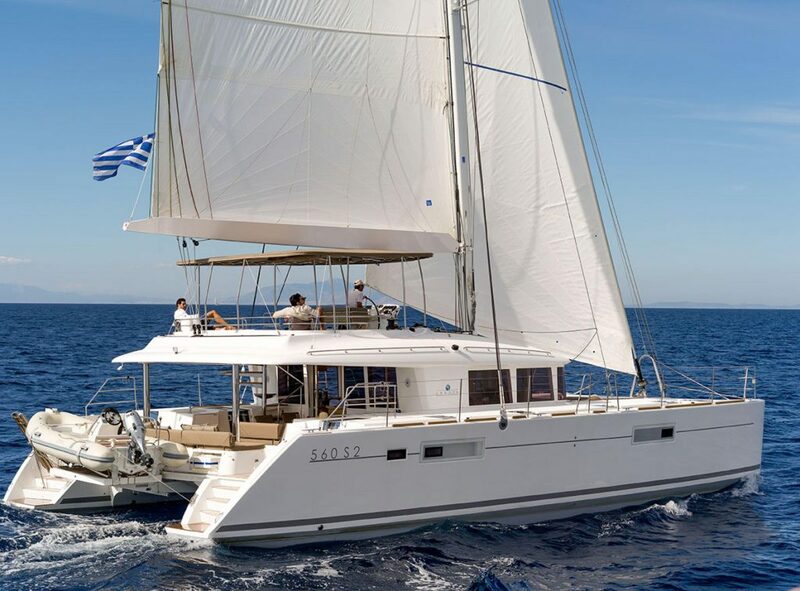 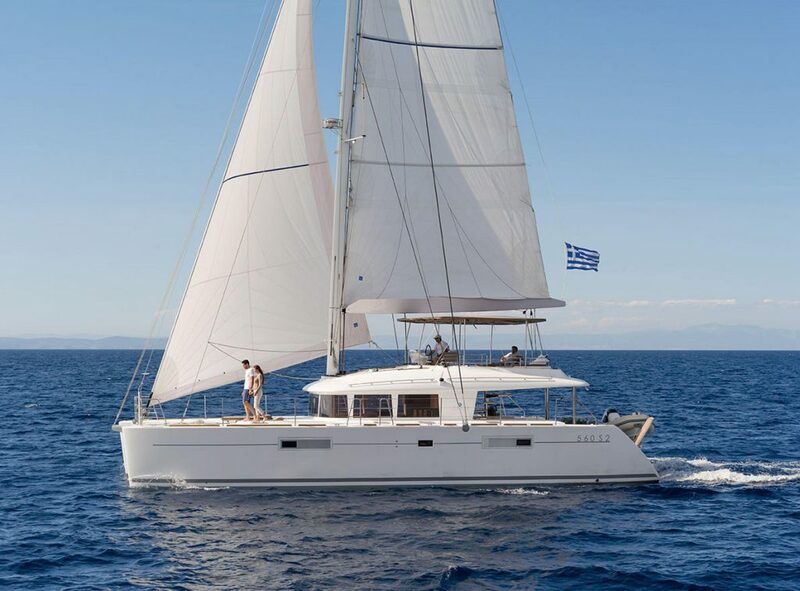 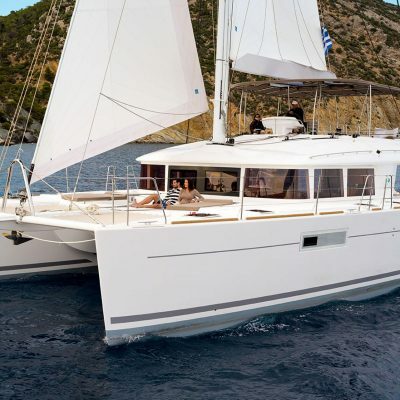 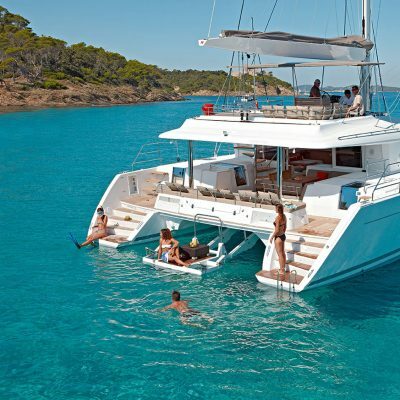 robin@horizonyachtcharters.com Please scroll down to read more about this excellent catamaran. 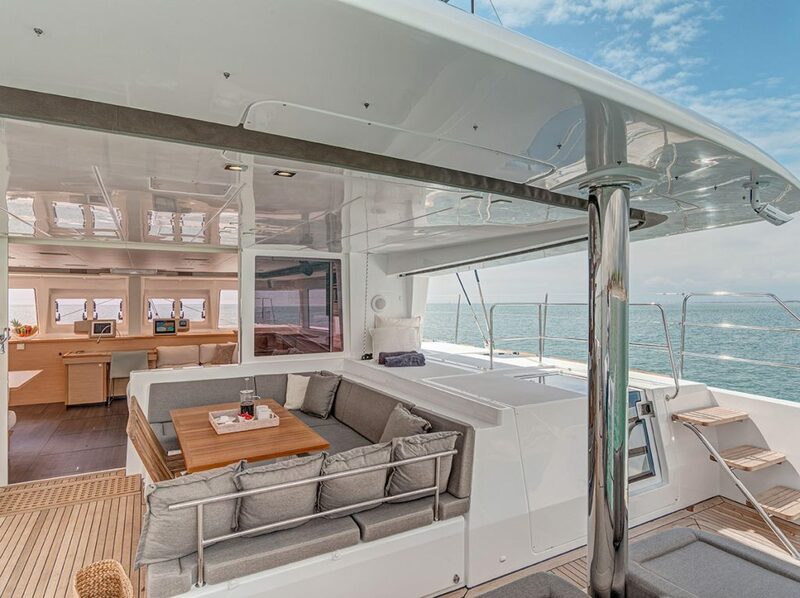 The fly-bridge is a veritable upper-deck saloon and it towers above the boat giving a fantastic all-around view. 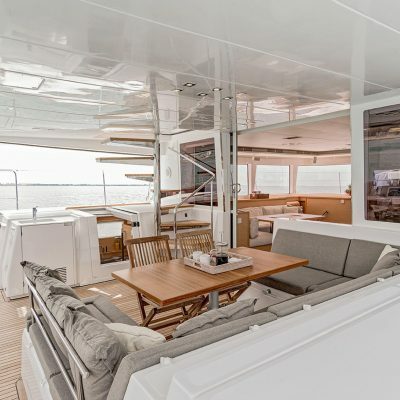 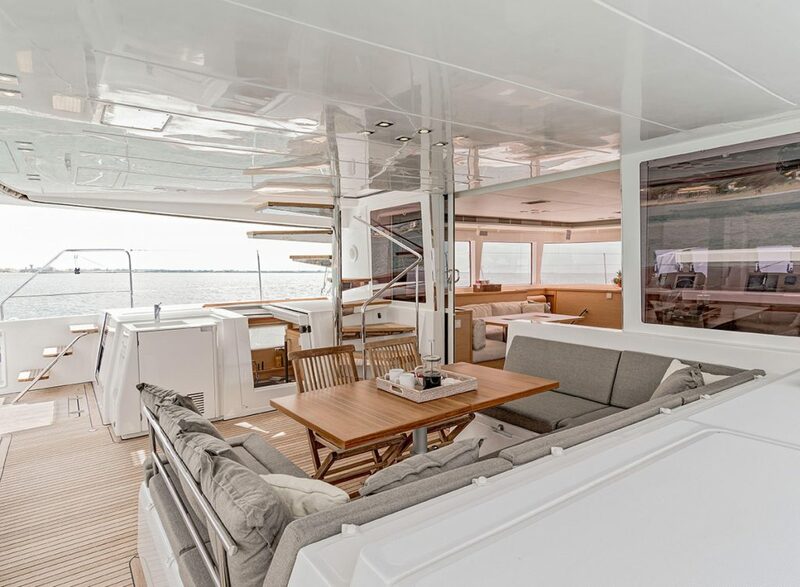 It has sun-protection from a large bimini and is accessed up a closeable spiral staircase from the main deck. 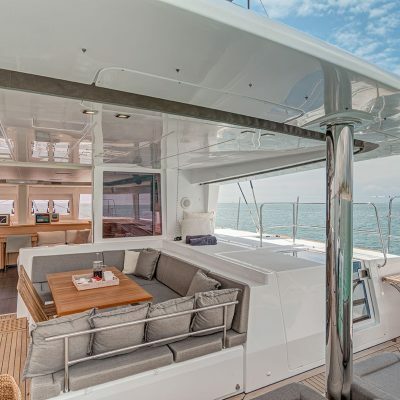 The impressive helm station is set forward and just behind is a huge comfy seating area with extensive sunbathing cushions set on the cockpit roof. 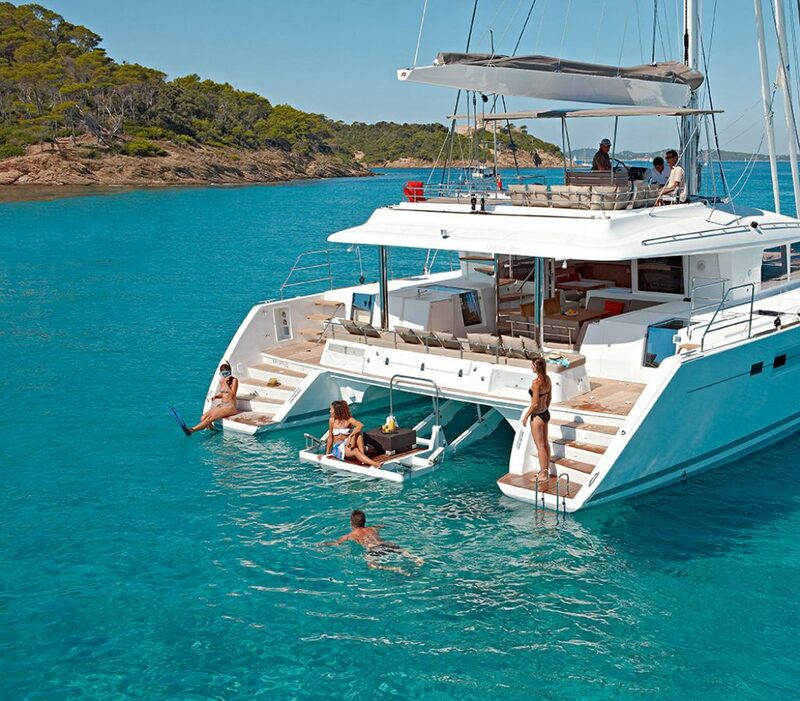 This arguably is this boats main attraction! 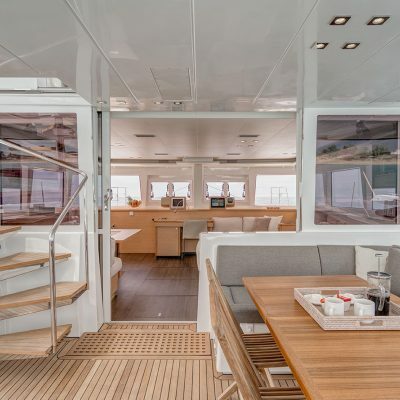 The cockpit below is fully covered and protected from sun and rain alike and has plenty of luxury seating and outside dining for 8 or more people. 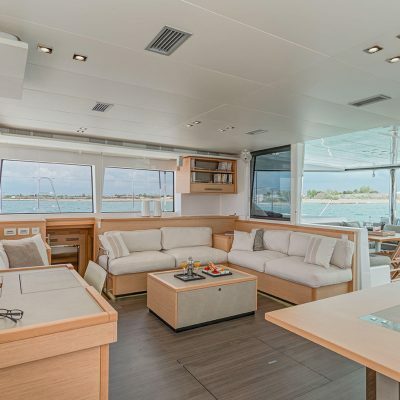 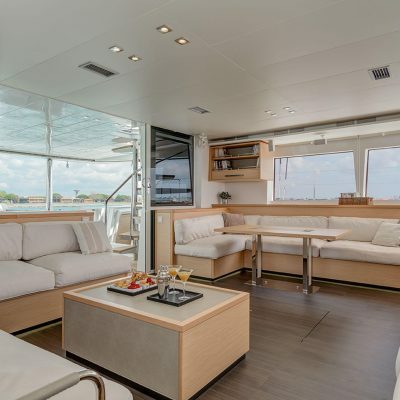 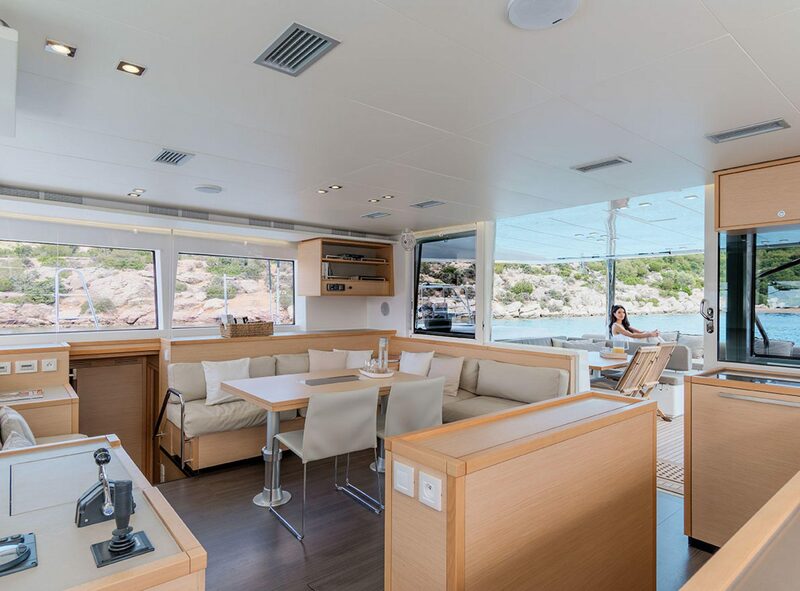 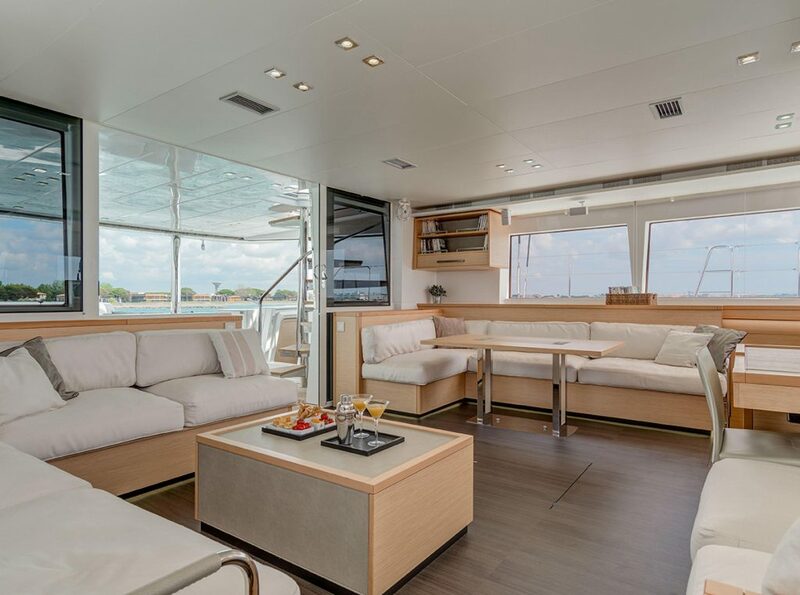 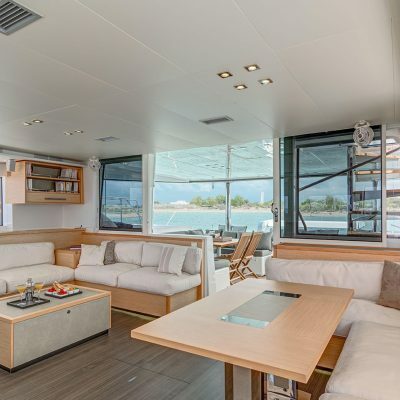 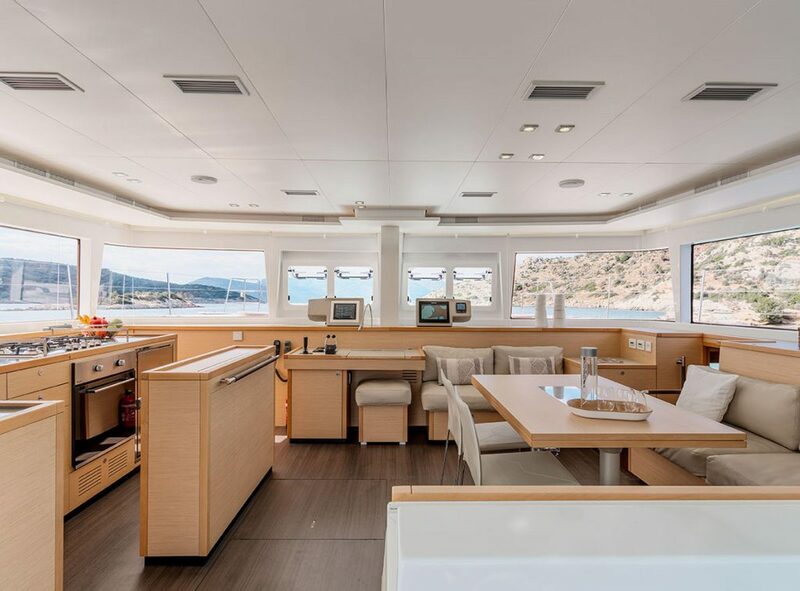 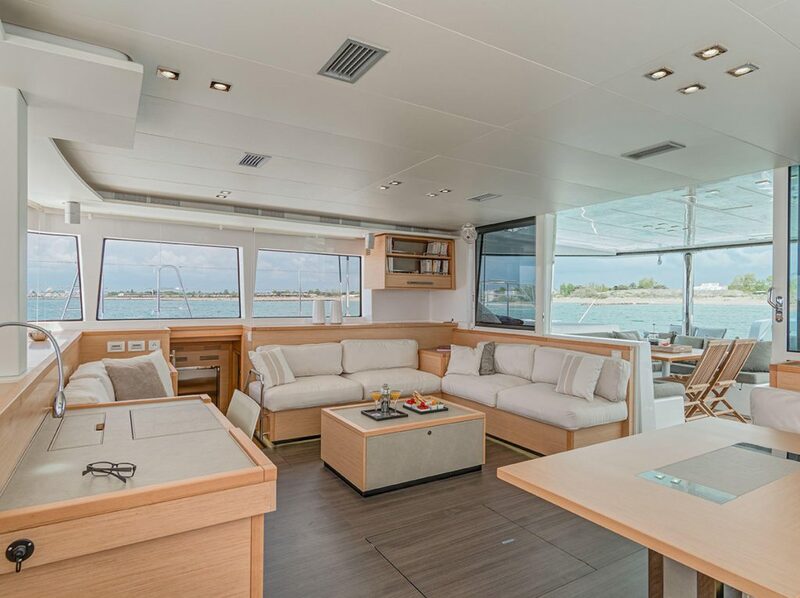 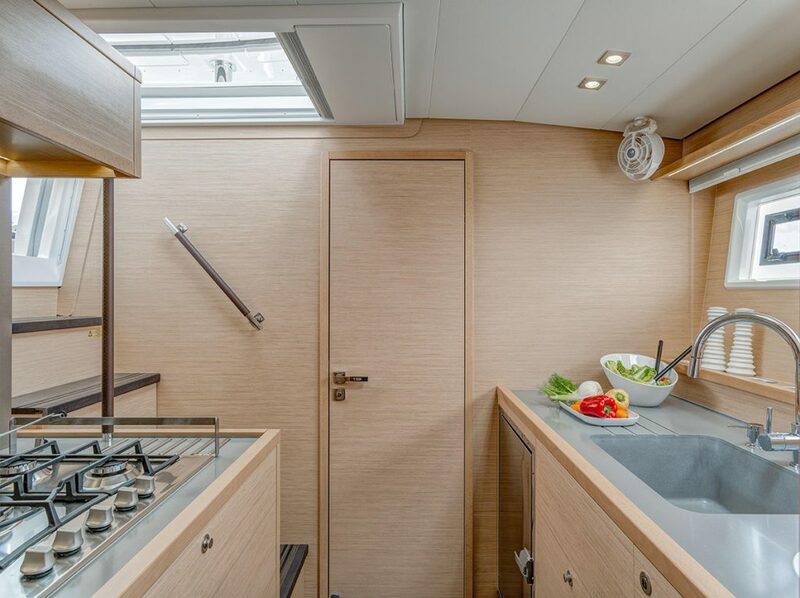 Going through a large sliding door brings you to a sumptuous saloon and galley. 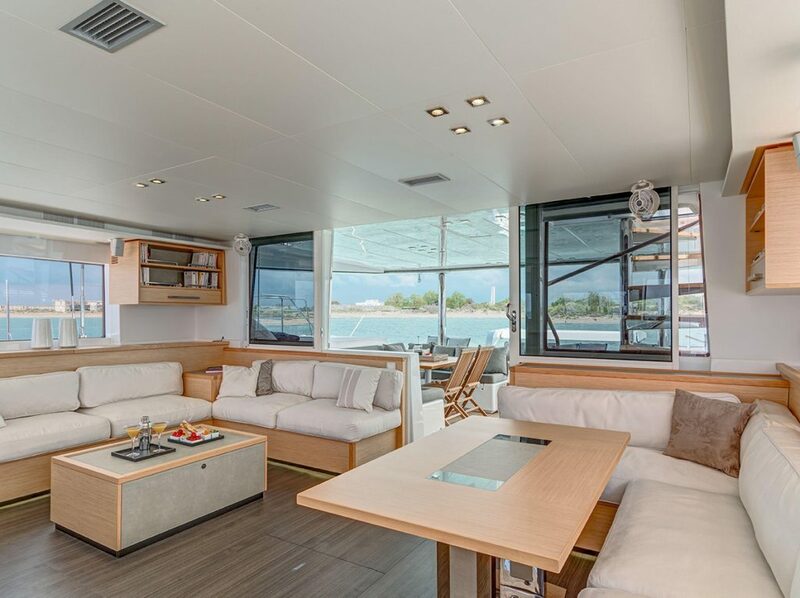 All on one level this gives an enormously enjoyable living area. 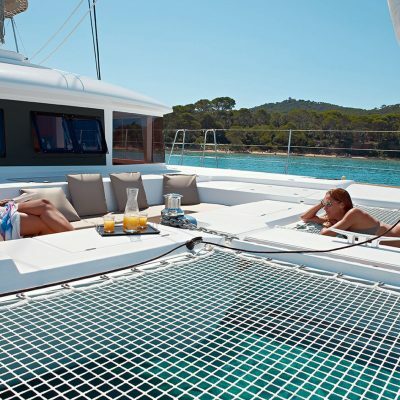 Behind the cockpit, and between the user friendly transom steps on each hull, is a dinghy tender-lift that doubles as a superb sunbathing swim up platform at anchor. 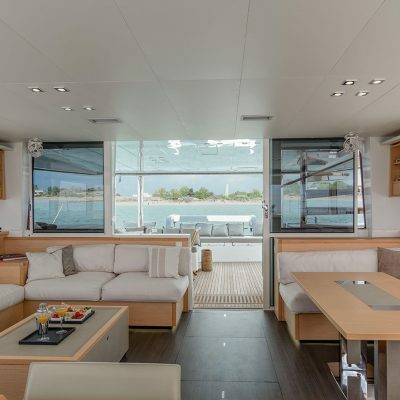 Up forward there are large trampolines and another large and practical seating area. 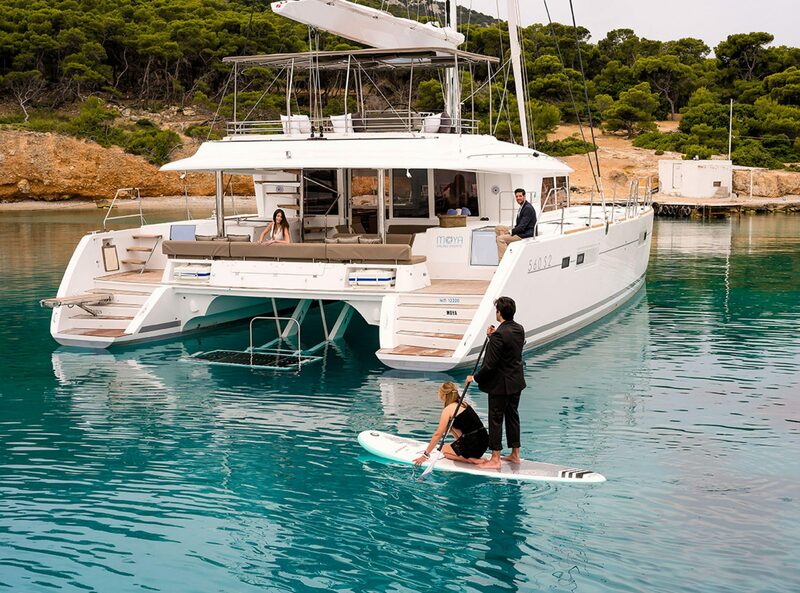 The transition between bow and stern is via wide, safe side decks with plenty of handholds. 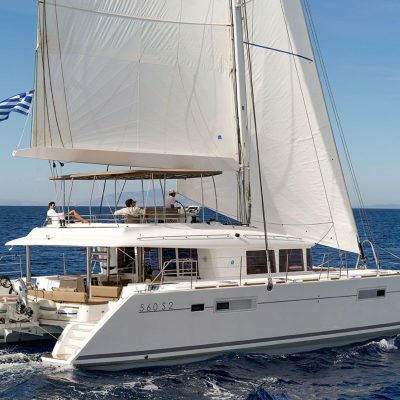 Although a large boat she has impressive sailing performance and you can expect over 9 knts in 20-25 knots true breeze. 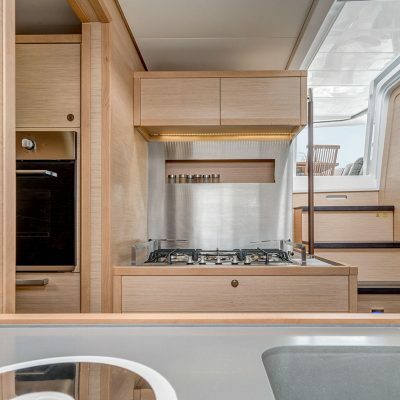 The Lagoon 560 features an infused balsa core hull above the waterline which keeps the structure strong, stiff and light, whilst below waterline it’s solid glass. 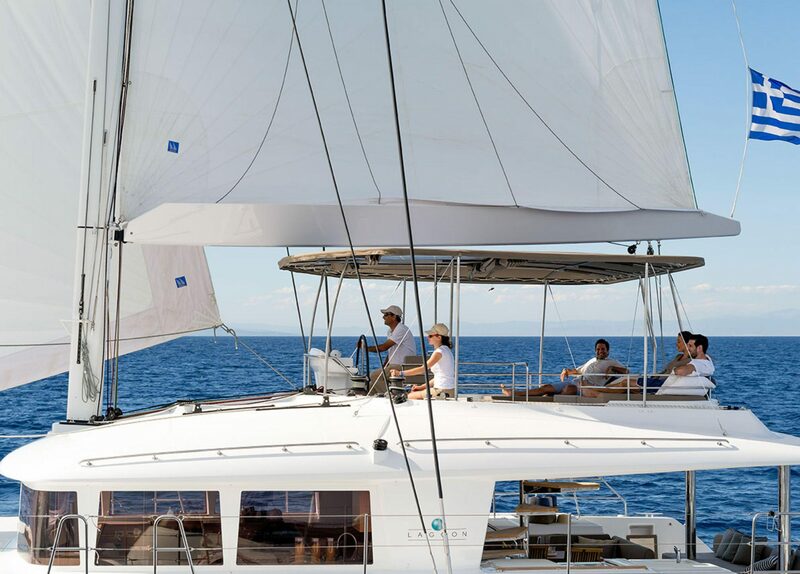 This helps to save weight and improve all round performance and the gull wing bridge deck helps ease the ride in choppy waters. 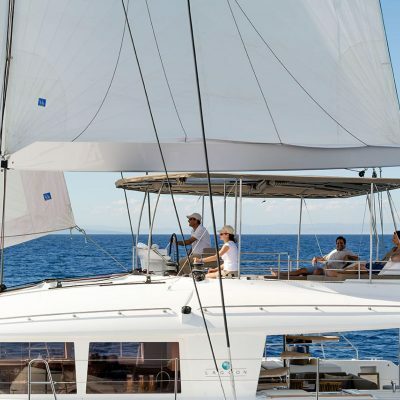 At the helm, visibility is excellent and sail handling is easy. 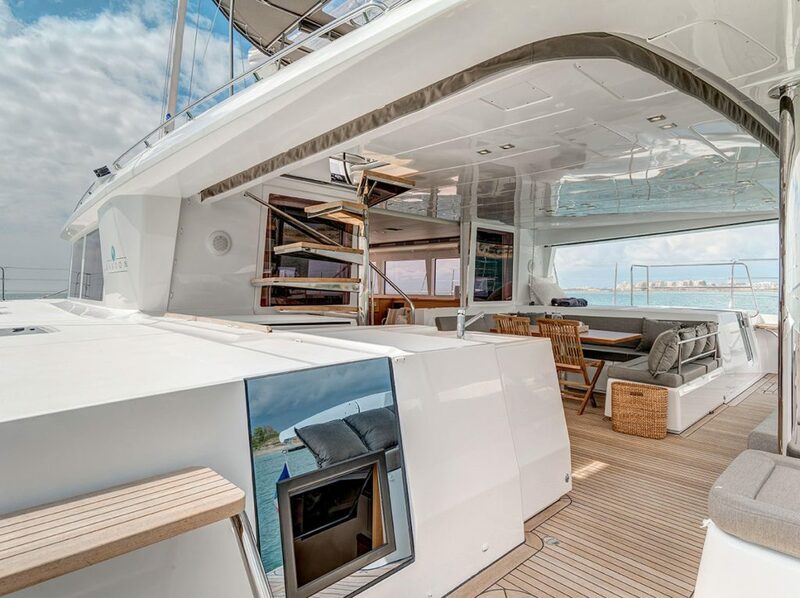 All the sail controls are led to 4 electric winches on either side of the fly-bridge set close to the massive steering wheel. 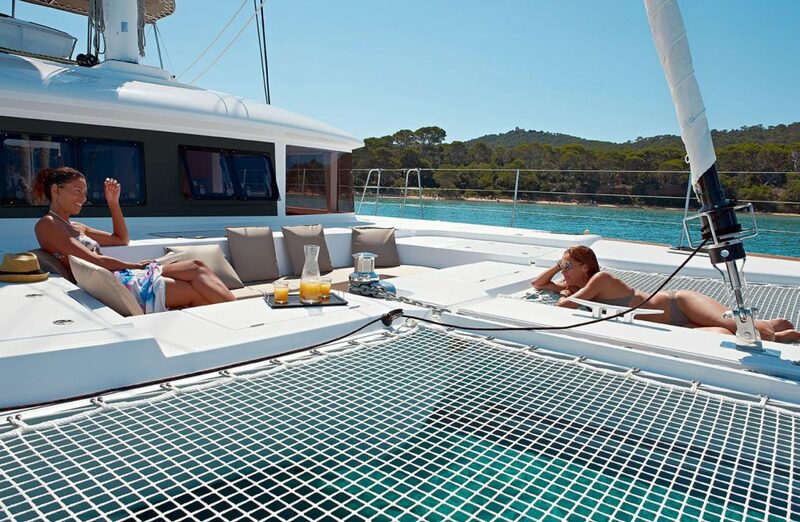 The excess line is stowed in neat mesh boxes built into the deck which helps keep the whole area neat and tidy. 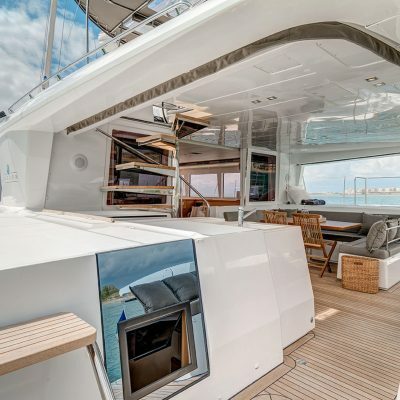 The navigation equipment, electronics and engine controls are well laid out in front of the wheel. 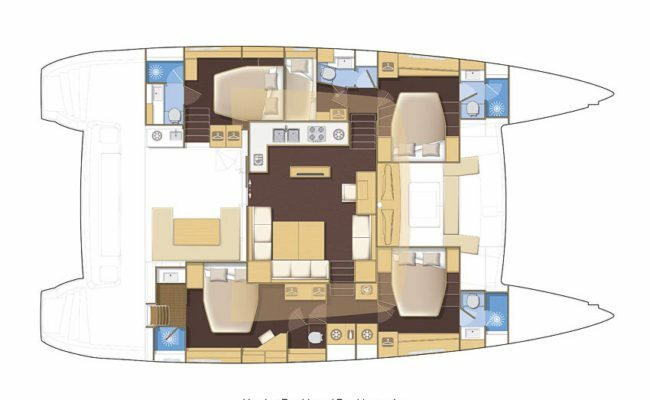 Under power she handles well, is surprisingly manoeuvrable and the Yanmar 80HP diesels will cruise comfortably at 8knts at 2300rpm. 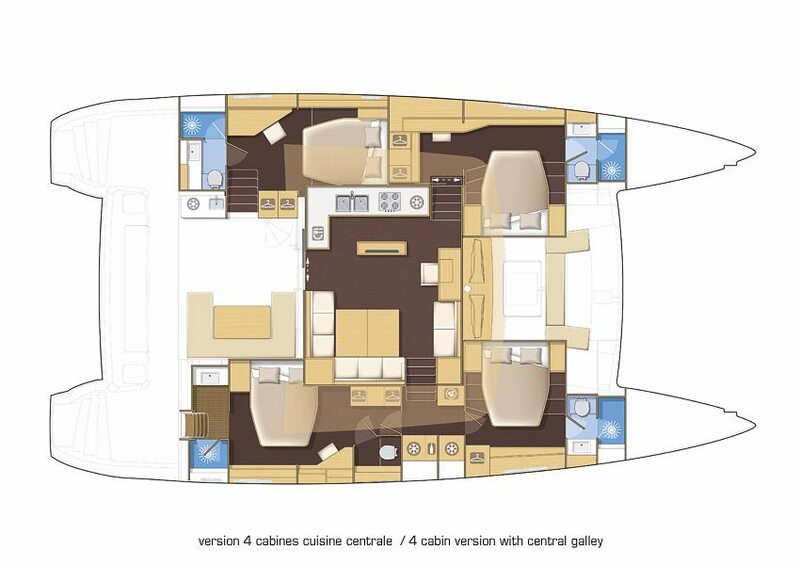 The four cabin version has options for a galley in the port hull, or in the main deck saloon. (See the layouts here). 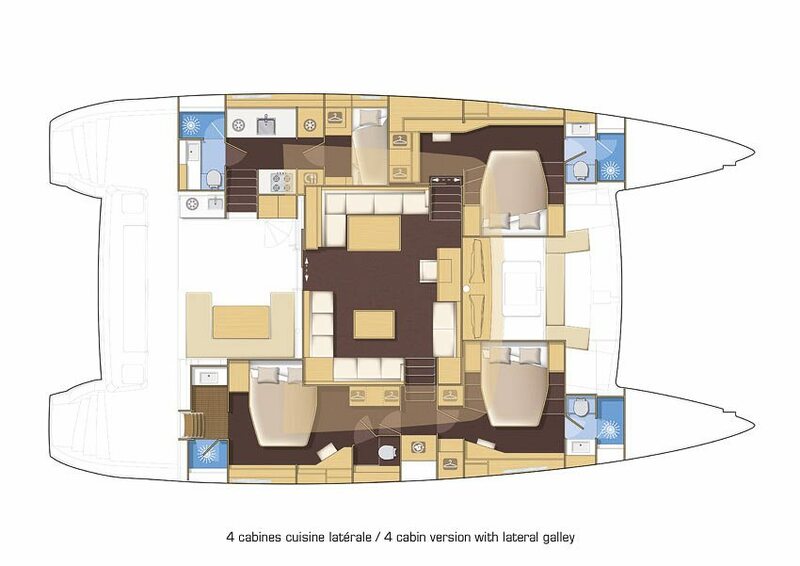 Both feature stunningly comfortable cabins. 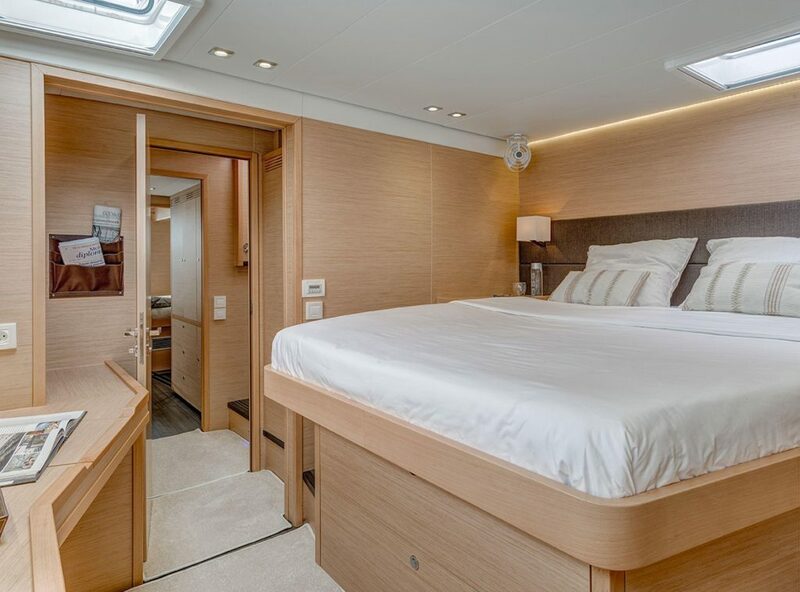 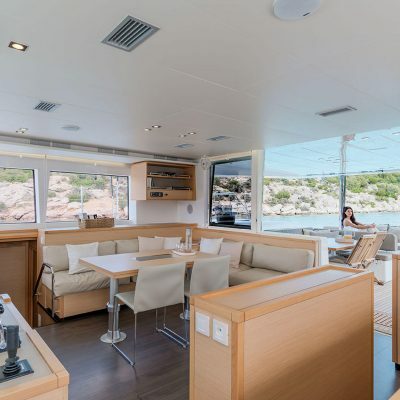 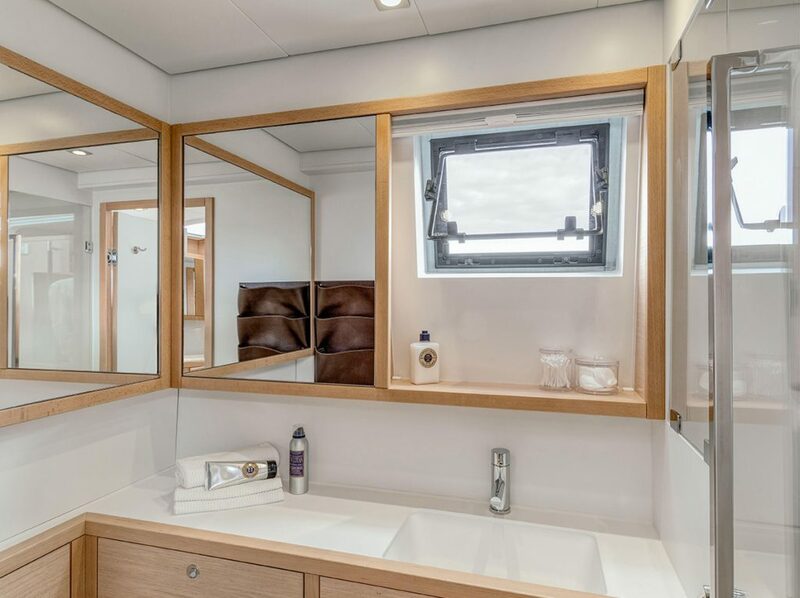 With the more conventional layout with galley on the main deck all the cabins have with very large double beds, three set athwartships. 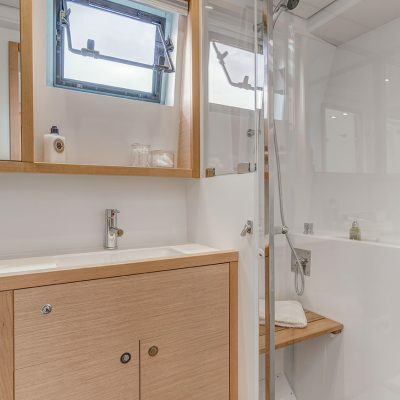 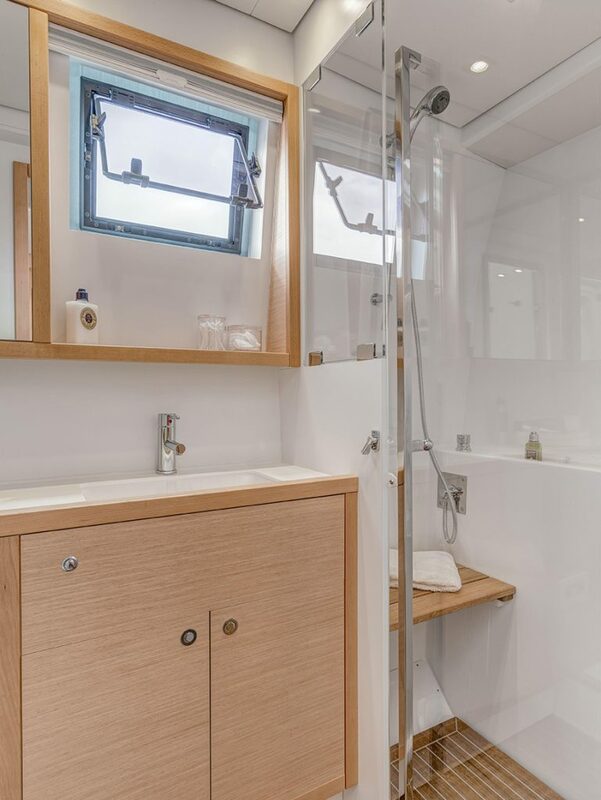 All offer VIP comfort, masses of elegantly practical storage, and large hull windows for light and separate tastefully designed washrooms. 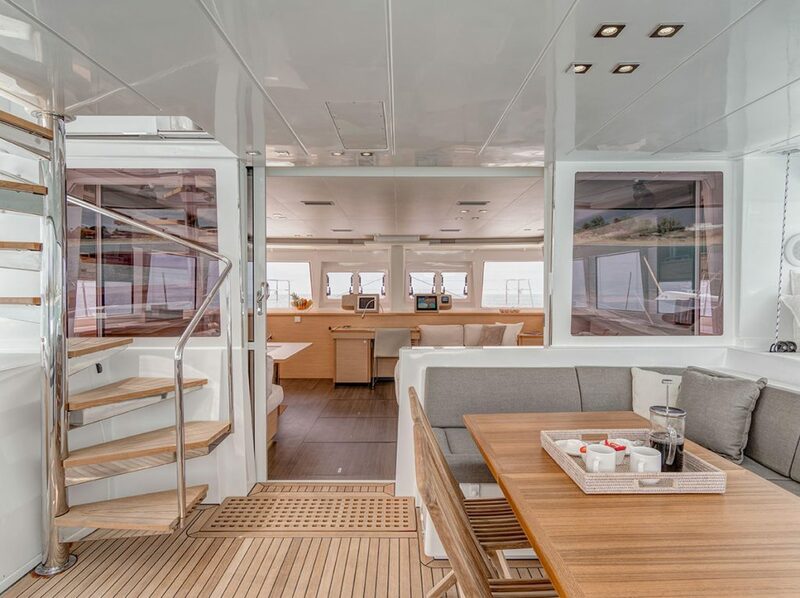 The starboard aft “master” has private direct access to the outside deck. 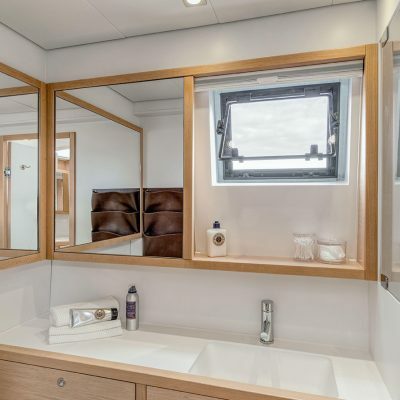 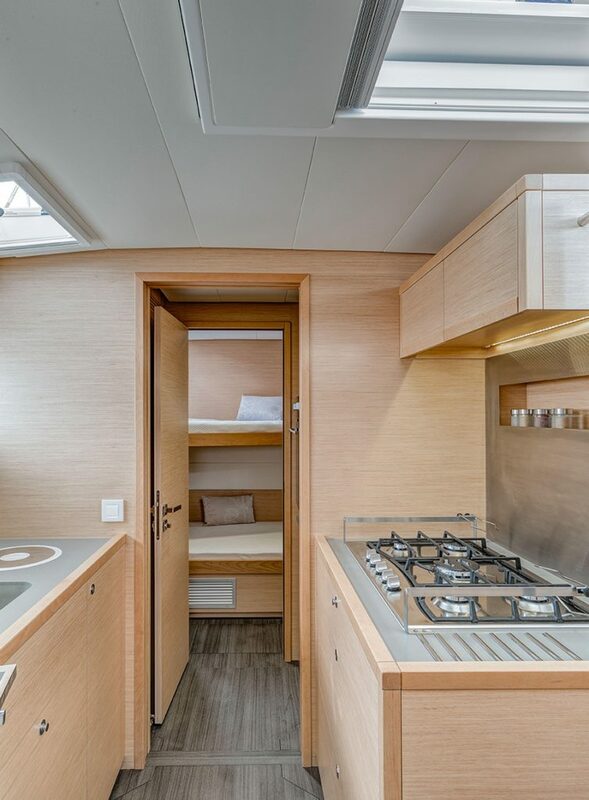 In the five-cabin layout single bunks and another head and shower are inserted between the two port cabins. 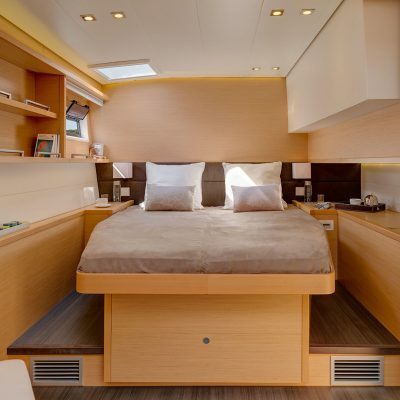 This steals a little room from each, but still leaves plenty of space. 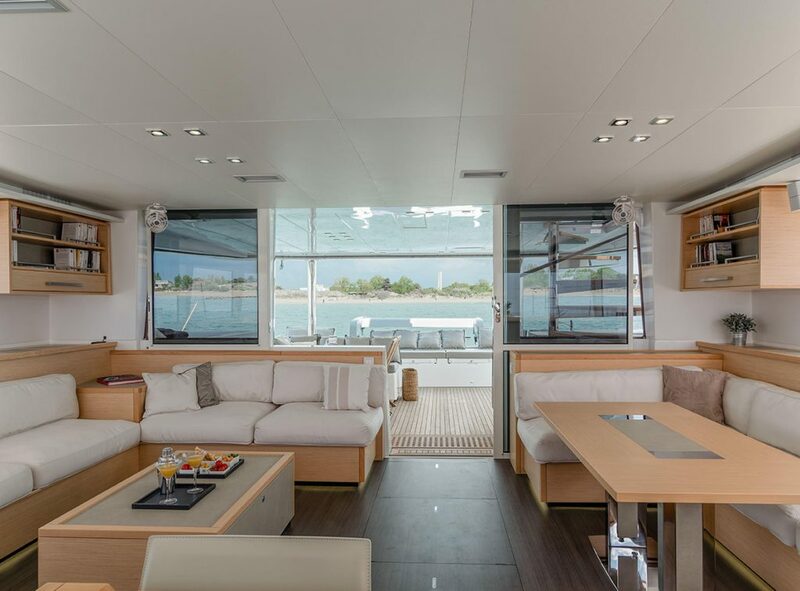 The signature wrap around saloon windows give masses of light and headroom. 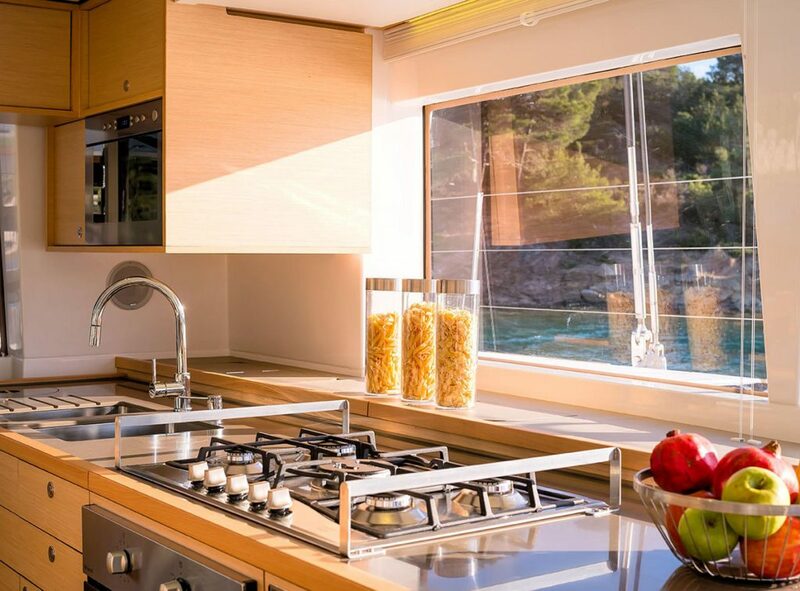 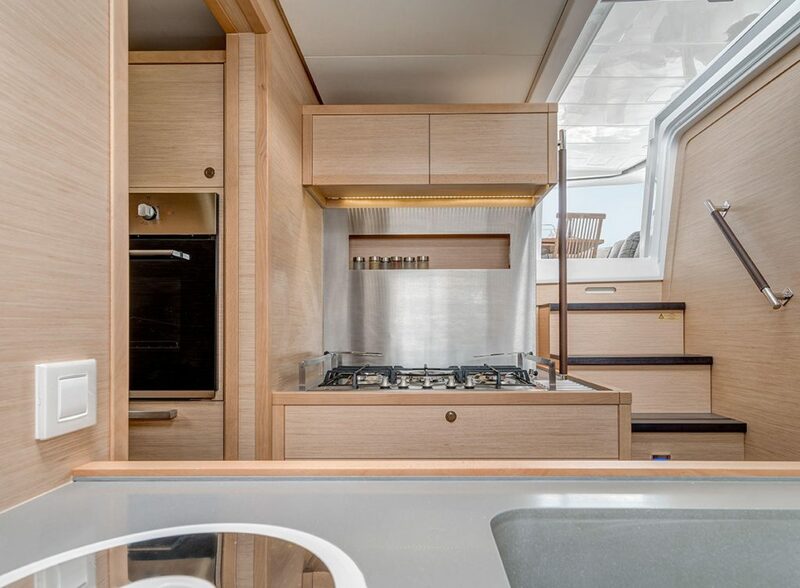 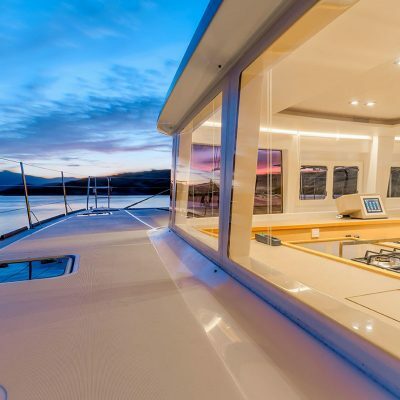 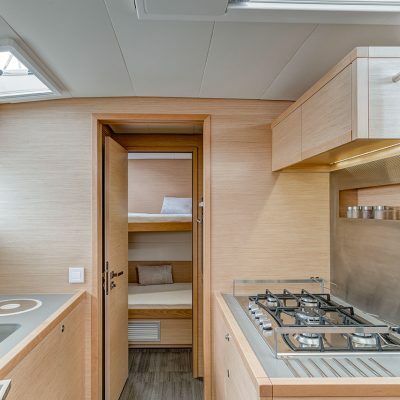 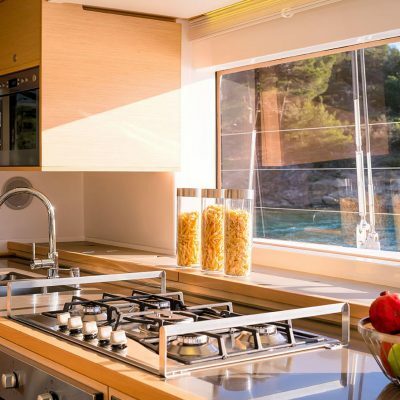 The L shaped galley boasts a four burner stove and separate oven. 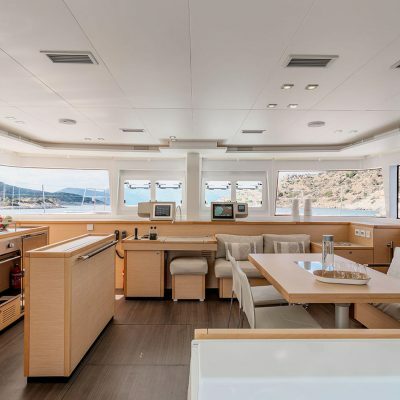 There is a central island giving more counter top, space for a fridge and storage, and even an area for a flat screen TV. 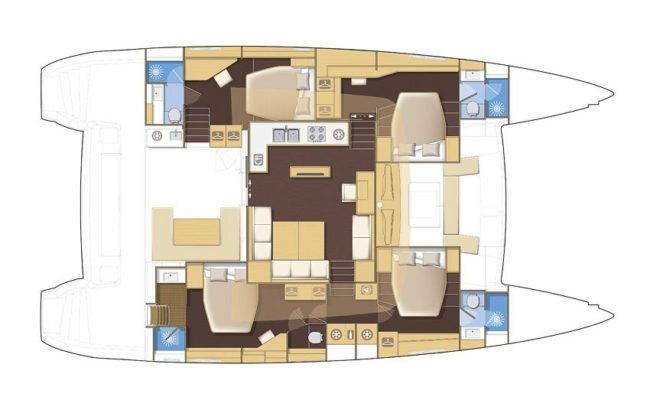 The saloon seating is very agreeable and up forward there is a forward facing chart table. 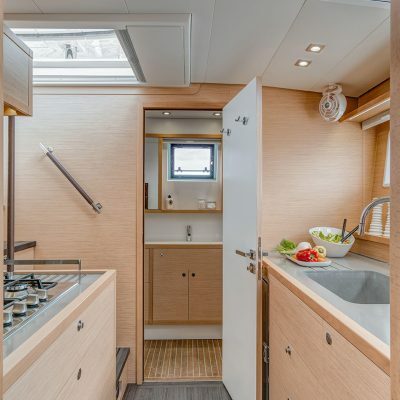 This has a full width dashboard which includes stowable electronics pods. 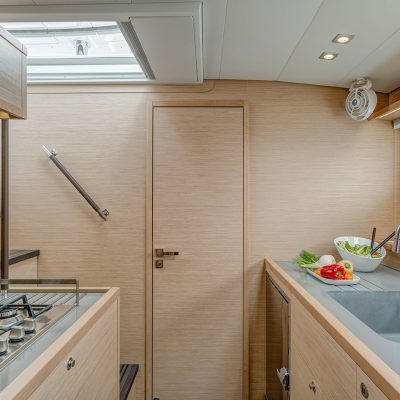 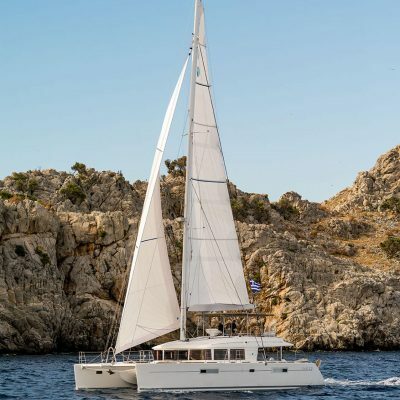 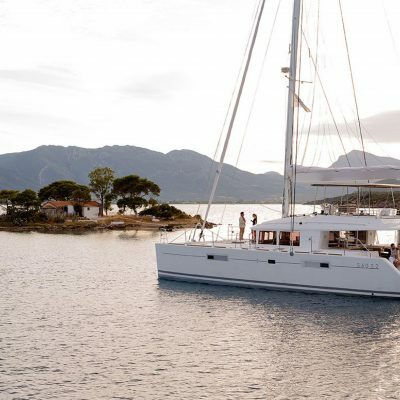 The starboard pod holds a chart-plotter and sailing instruments; the port pod features a touch-screen display allowing you to monitor the boat’s electrical systems and tankage. 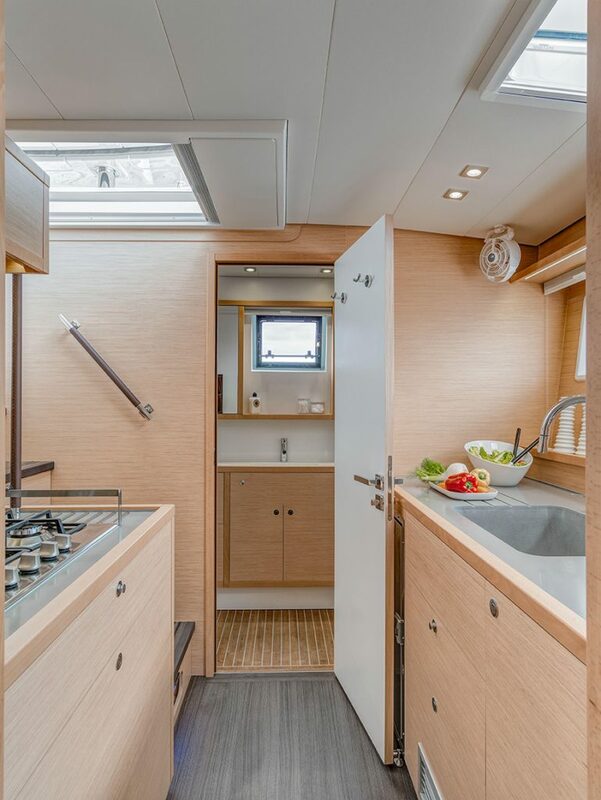 The overall feel is one of openness, style, exquisite quality and optimal use of space. Essential: this version comprises all the essential features to ensure you get the best out of your Lagoon 560 at the most affordable price.